You already know that an important part of successful medical weight loss is regular exercise. But sticking to a regular exercise schedule can be a real challenge. Between your work and family commitments, you may struggle to even find time. Below are four common struggles and tips for how you can do to overcome them to ensure you achieve your weight loss goals. Between your job, your family and trying to find a little time for yourself, it’s easy to feel that there’s just no time left in your schedule for the gym. Remember, exercise doesn’t have to happen at the gym. Naturally squeeze it into your day by making a few basic changes. Drive less and walk more. If you can, walk or bike to work, or park your car at the back of the parking lot or a few blocks from your destination. Take the stairs. Go for a walk during your lunch break or if there’s a gym nearby, take a midday exercise class. Build exercise into your weekends. Here in California, we’re lucky enough to enjoy gorgeous weather year-round. So take your kids to the park and run around with them, go for a hike, or take a dance class with friends. Once you start making exercise a priority, you’ll be amazed at how much time you can find! There’s nothing more boring than jogging on the treadmill or elliptical five times a week. Beat the workout blues by changing up your exercise routine. If you’re tired of cardio, try taking a Pilates or yoga class once a week. If your gym offers personal training, consider a few training sessions. Your trainer will help design a routine that’s different from your usual exercises and challenges your body in new ways. And if you’re sick of the gym, get active outside! Try swimming or cycling, or go for a long walk through the neighborhood with friends. 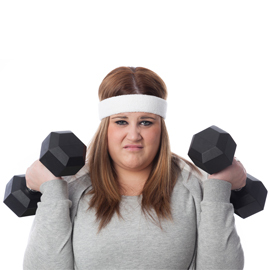 Whether you’re self-conscious about your appearance or not familiar with gym equipment, working out in front of others can be uncomfortable and even embarrassing. Don’t let it be! Start at home with an exercise DVD or invest in a home treadmill to build up your confidence. When you do join a gym, take advantage of a free personal training session to introduce yourself to the different machines. If you aren’t sure how to use a machine, just ask– no question is dumb and your trainer is there to help you! If you hate the gym crowd (we don’t blame you – no one likes working out in a place packed with sweaty bodies! ), trying going during off-peak hours, like the middle of a weekday afternoon. And remember, no matter how silly you think you look, your body loves you for working out. So be proud of the commitment you’re making to lasting weight loss! After a long day at work, the last thing you want to do is hit the treadmill. Avoid post-work exhaustion by going to the gym in the morning. Twice a week, aim to get up an hour earlier. While it may be tough the first time the alarm goes off, your body will naturally adjust to your early morning workouts, and you’ll feel fresh and full of energy afterward. Even better, you’ll be able to relax after work guilt-free!